← Concerned about the safety of the Red Shirts at the Apple Stores. Will they all make it through Christmas? 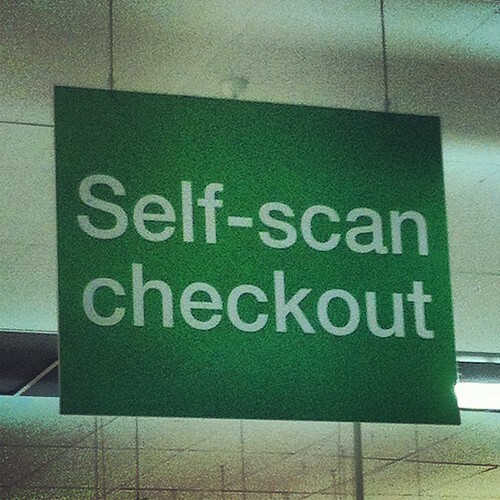 So, all the big name supermarkets are implementing self-scan checkouts. Is this to make checkout faster? Reduce staffing numbers? Save the supermarkets money? Or just put more load back on the customers? A bit like ‘client side scripting’ I suppose. Although, some checkout operators have complained about the amount of down time and the number of times they need to be fixed. Just another way management are trying to increase the bottom line, and disenfranchising customers. This entry was posted in Photos, Shopping and tagged Coles, photo, self-serve, Shopping. Bookmark the permalink.